I cannot express how happy I am right now 🙂 It has been an absolutley epic day!! EPIC!!! It started off with Molten Core rep farming and DING! MC was my first ever raid, and I never ran it enough to get exalted back in vanilla – only honoured, it has taken me years to get it done. I really wanted it to be completed before MoP – I just had to find the time to do it! Next is BT which I only have to clear 5 times. 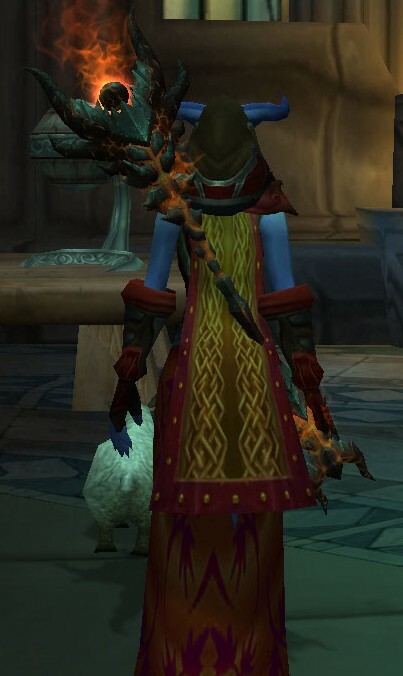 I also found fantastic transmog robes – I love them!! I have since discovered finding things to match it will be a problem. I will persevere though, there has to be some sort of outfit I can make with them. The image doesnt really show the lovely leaves around the back and gorgeous detail. I really love them though!! So I am on a mission now!! I then did LFR on my druid and scored my tier leggings, which gives me a set of 4 now. I am so wrapped as that was the last piece I was chasing 🙂 I will continue to gear her up with VP gear and LFR stuff, but I can do 10 mans on her now as she s above the 385 ilevel that a lot of people ask for. Anyway after a few false starts for DS pugs, we just always had a couple short that we couldn’t find, and so would wait around 40 minutes then disband. So after some more waiting around, I found a group made up of people from he previous pug I had run which was a success. That is Deathwing – DEAD!!!!! After all the horrific PUGS in the last few weeks I never thought it would happen. We would get so close and then just not go anywhere. I also got the 25,000 Valor Point achievement as well but my screenshotter didn’t get it. I thought it was kind of cool that I scored that achievement with the DW one. So after all that excitement I decided to log off and just bask in the fantastic day I just had! I am content now, I have killed DW on 10man, I just have to get Rags down and I will be completely up to date and ready for MoP 🙂 I can just focus on chasing the achievements I want to!! Oh WoW, that is an epic effort and I love the way your achievements glow in the shots. Congratz on everything, but most of all your DW kill! Awesome work or great one: And i know how you feel, got my DW kill and got dragged into a 10 heroic last night and got morchock and Yorsaj as well and we got down to 3 percent on heroic ultraxion. All i can say is keep looking for a guild that fits, definately worth the effort. i was worried i wouldnt be able to keep up in the new guild and to be honest im not up to standard yet but was able to stay out of fire, follow instructions and my dps was not bottom so that helps. You can do it when you dont have the hassles of being raid lead and lstening to all the idiots bleating at you. LOL re the bleating 🙂 You know me better than most Kolibear – I will say I am going to stay away from raiding but the only way that will happen is if i quit the game and I don’t want to do that! Hey well done on all of that, its an impressive list for one day! Yeah I thought so, I like having achievement days, I have missed them 😀 I am hooked on the gold sparkle – it’s like a drug!! I have to ask, what addons do you use in your UI. Cause I like the look of what I’m able to see in your screenshots, and I’d like to duplicate that kind of cleanliness in my own UI. Thank god i remembered to make profiles this time 🙂 It was so much easier to set up!! Previous PostPrevious How many fish? Next PostNext Need your help healing!